President Barack Obama’s recent statements on the current state of peace talks between Israel and the Palestinian Authority have sabotaged U.S. Secretary of State John Kerry’s efforts to iron out a framework agreement between the two sides, Israeli daily Ma’ariv reported on Wednesday citing high level sources. Specifically, aides to the Secretary of State referenced Obama’s interview with Bloomberg View columnist Jeffrey Goldberg, published just hours before the President was to meet with Israeli Prime Minister Benjamin Netanyahu, Ma’ariv said. During the interview, Obama warned of a “bleak future” and a “demographic disaster” if Israel does not support a U.S.-drafted framework peace agreement with the Palestinian Authority. “There comes a point where you can’t manage this anymore, and then you start having to make very difficult choices,” Obama told Goldberg. There are several theories regarding Obama’s possible motivation for granting the interview, Ma’ariv reported. Some Washington insiders have speculated that the U.S. President is not up-to-date regarding the progress that has been made behind closed doors between Kerry and Netanyahu. As a result, Obama vented his frustration at what he perceives as a peace process that’s at an impasse, Ma’ariv said. 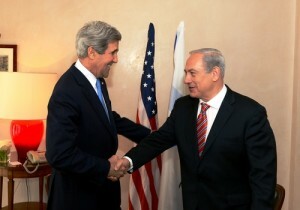 Another source even claimed that Obama may be jealous of Kerry’s diligence and diplomatic skill, Ma’ariv said. According to this train of thought, the President is compensating for a first term plagued by his own failure to orchestrate a peace deal between Israel and the Palestinian Authority by now taking over the reigns from a Secretary of State who has been praised for his stick-to-it approach.